If only we could persuade the BBC to issue a multiple-CD compilation set of the numerous Procol Harum sessions listed below! After all, if it was worth doing for Led Zeppelin ... ! 'Beyond the Pale' has twice written to the BBC archivists and never been graced with a reply; we learnt in March 1998, however, that Westside Records are contemplating the commercial release of certain BBC sessions. After a long hiatus, we also heard that Strange Fruit records had plans to release BBC sessions. Who can guess what will ensue? Pat Keating advises that a bootleg named Through the Garden Fence contains tracks marked *, while another named BBC Classic Tracks contains those marked $; the documentation, however, remains inconsistent and problematic. Pat and Roland both recall that the songs broadcast, except Juicy John Pink, were simply the album versions, odd though this may seem. The impression persisted on 9 May 2004 when BBC Radio 6 played the same Salty Dog track again claiming it was a BBC session: listen here ... the album version! Illustration: BBC transcription disc CN2785/S Stereo. 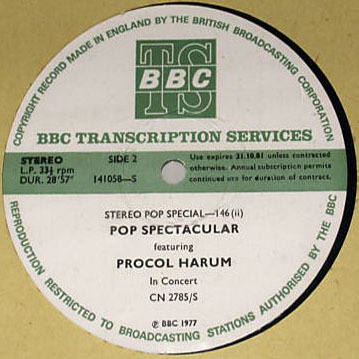 PROCOL HARUM In Concert - Stereo Pop Special 146; 57m 35sec: very collectable!